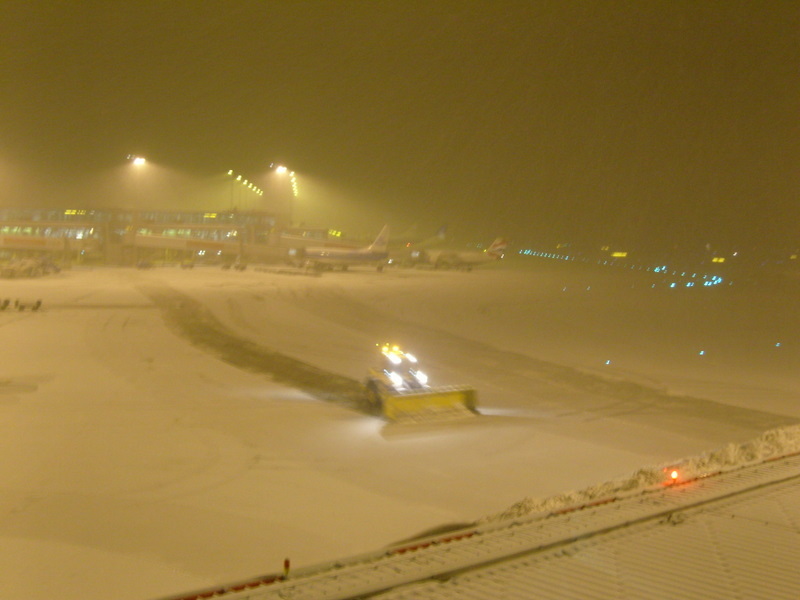 The evening of the 21st was spent mostly looking out at the valiant attempts made to clear the snow from Schipol airport. There were long delays all around, but at least flights were leaving. We were prepared to wait. Fear not – we found ways to pass the time. And shortly before midnight, only three hours late, we boarded. 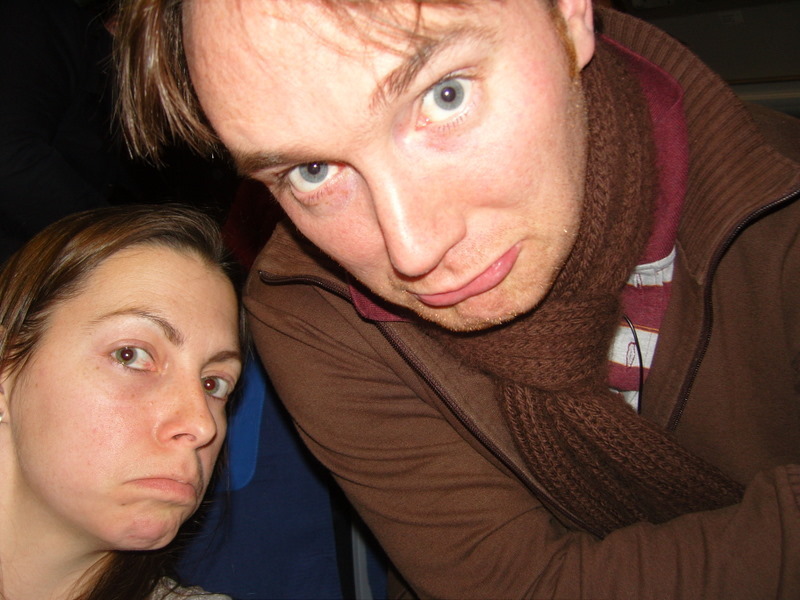 Alas, it wasn’t to be…after the plane had been de-iced and taxied to the runway we were grounded for the night by a technical fault. As you can see, this did not make us happy. We joined a long queue in the airport and ended up in the IBIS Airport Hotel at 3am for a couple of hours before joining another queue back at the airport at 5am. 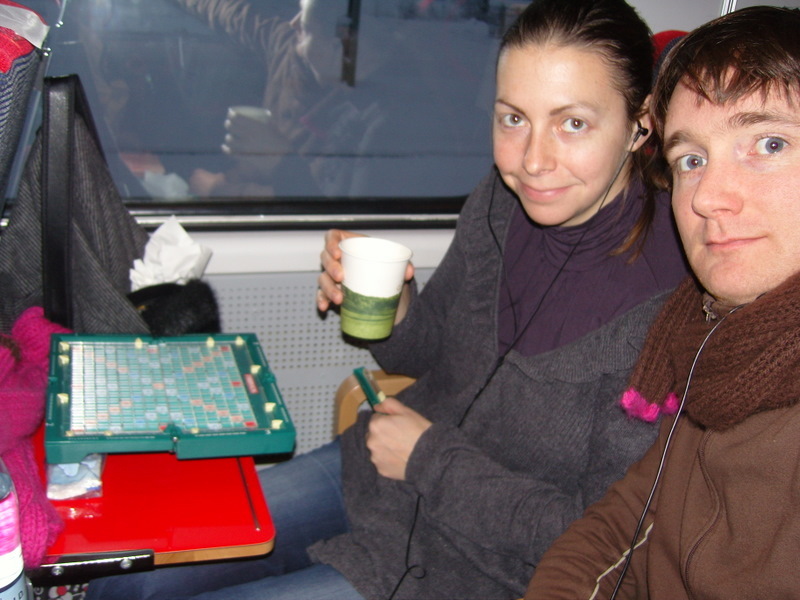 We eventually met a very nice man from KLM who put us in business class on a flight to Copenhagen that afternoon. 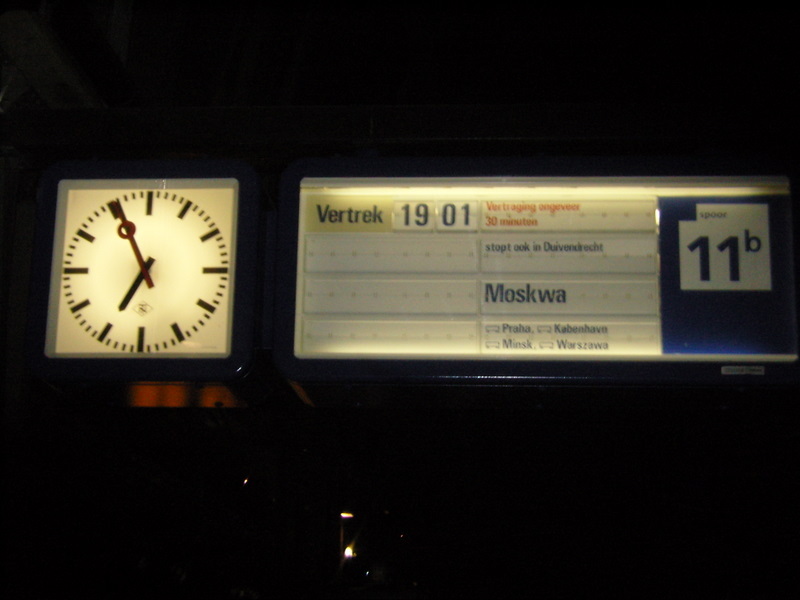 We got there on Tuesday 22nd, just a little more than 24 hours after the original train should have got us there. 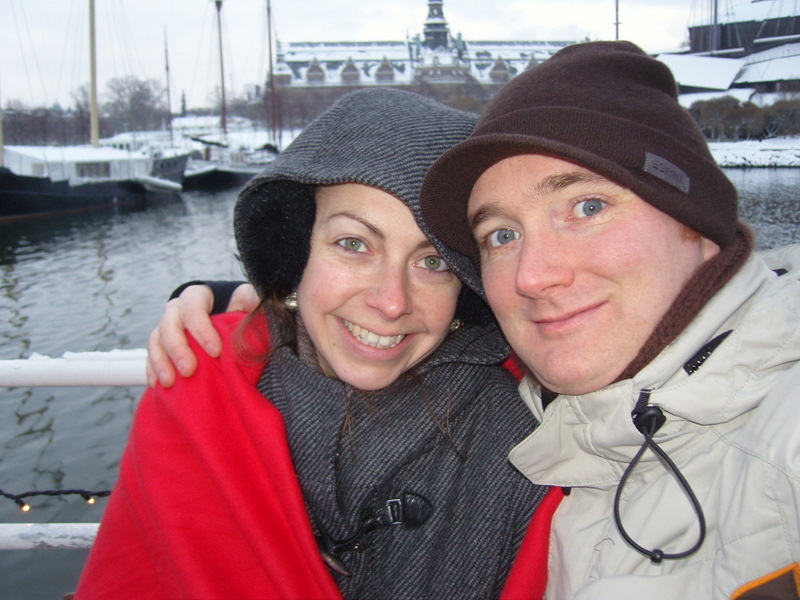 We only had one night in Copenhagen in the end, but we stayed at the zoo as planned. 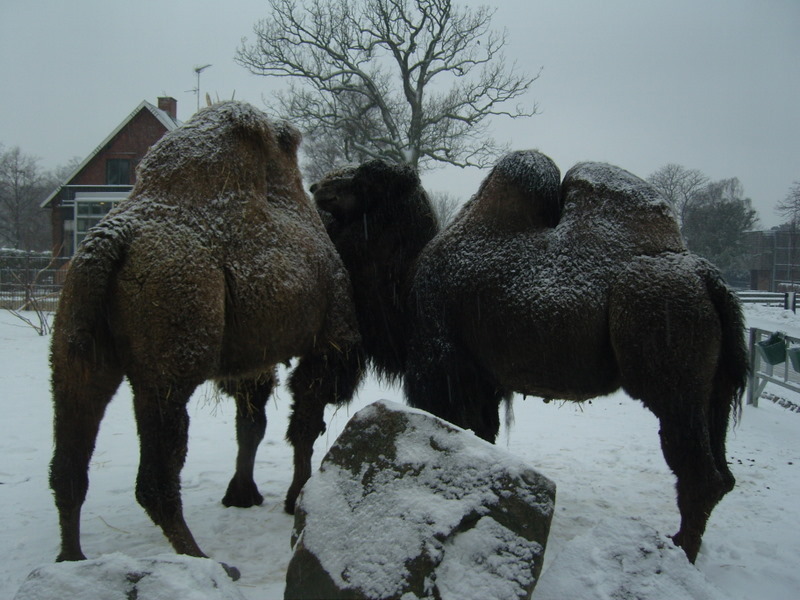 The camels didn’t seem too bothered by the snow, and neither were we. Ann-Katrine, a colleague of Eoghan’s based a Copenhagen Zoo, kindly invited us to her apartment where she laid on a really impressive array of smørrebrød (open sandwiches – the Danish version of a smorgasboard). These were washed down with an equally impressive array of beers and akvavit, which is a little like washing your dinner down with poteen. Only time for a quick stroll around Copenhagen city centre the following day – we can strongly recommend the Atlas Café for lunch if you’re ever there. 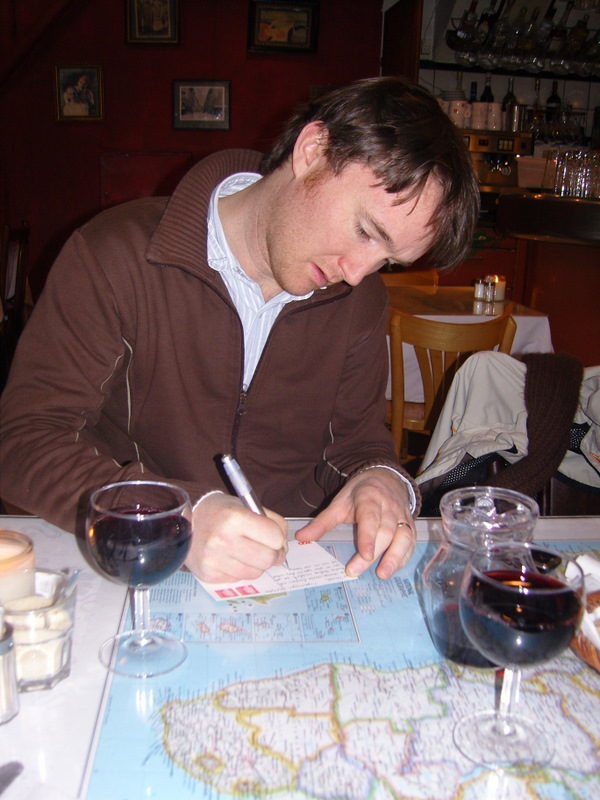 Besides missing Christmas, we would also miss out on a special celebration in honour of Eoghan’s new and only nephew Daniel – we sent a postcard to him instead. The bridge between Denmark and Sweden is impressive but it’s difficult to take a photo when you’re on the train. 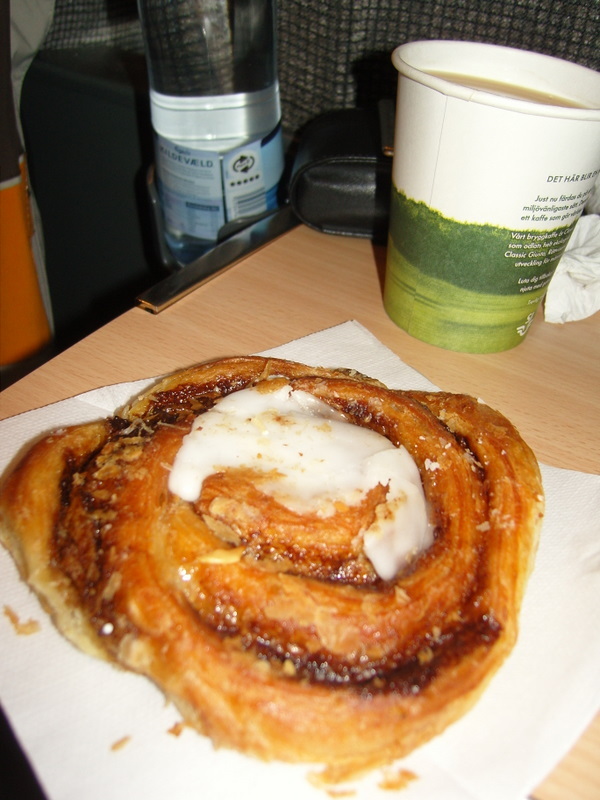 So here’s a photo of an authentic Danish pastry instead. This was eaten on the train. 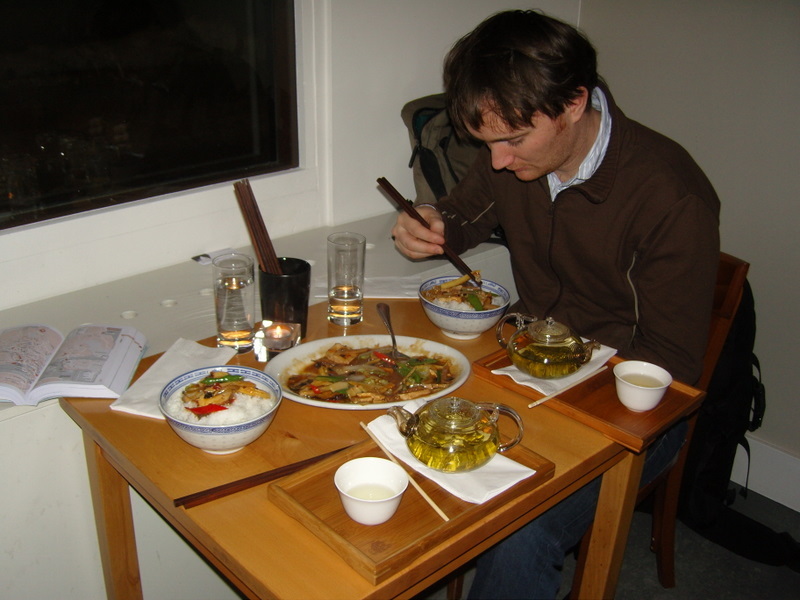 We went straight from the train to our reservation at Lao Wai, probably the best Chinese vegetarian restaurant in Europe. Really tasty food – highly recommended if you’re ever in Stockholm. 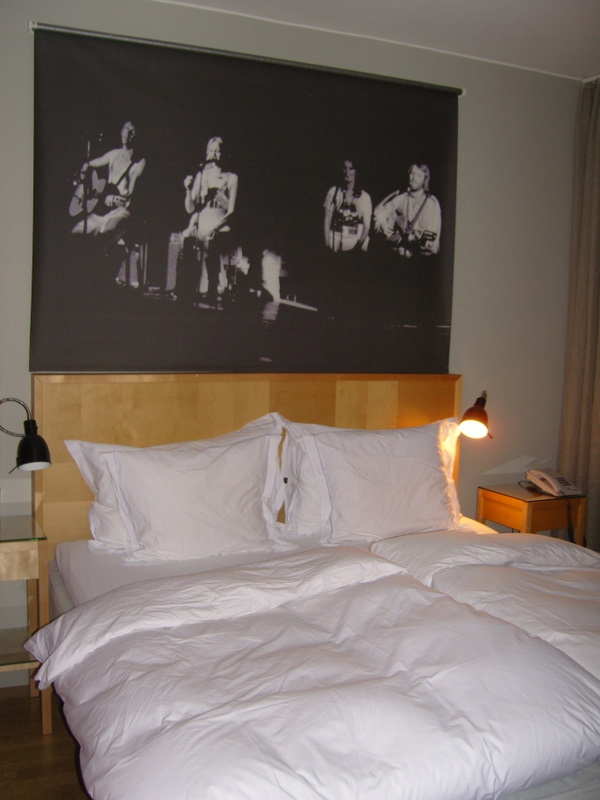 The Hotel Rival is owned by Benny from ABBA – they watched over us as we slept. 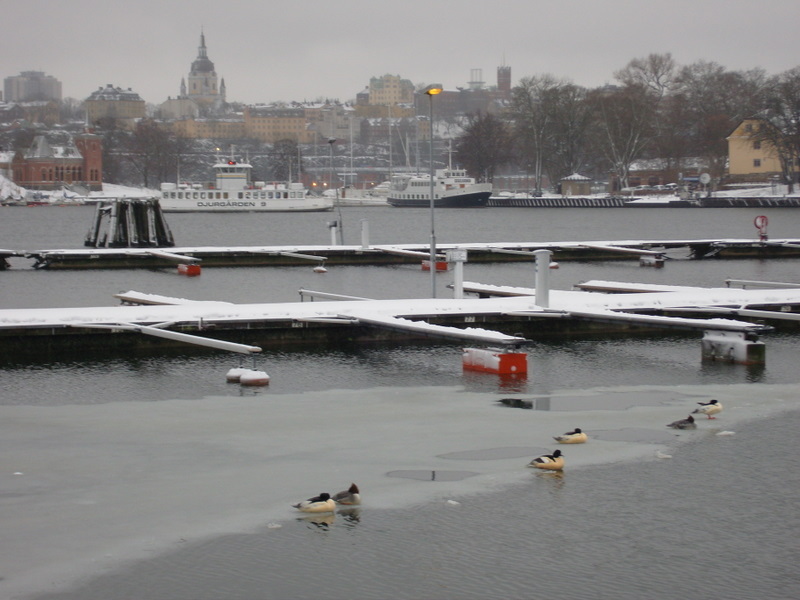 On Christmas Eve we took a boat trip around the harbour – it was both cold and informative. A few glasses of glögg afterwards took care of the cold. Santa Claus visited our hotel room that night (or was it Benny?! 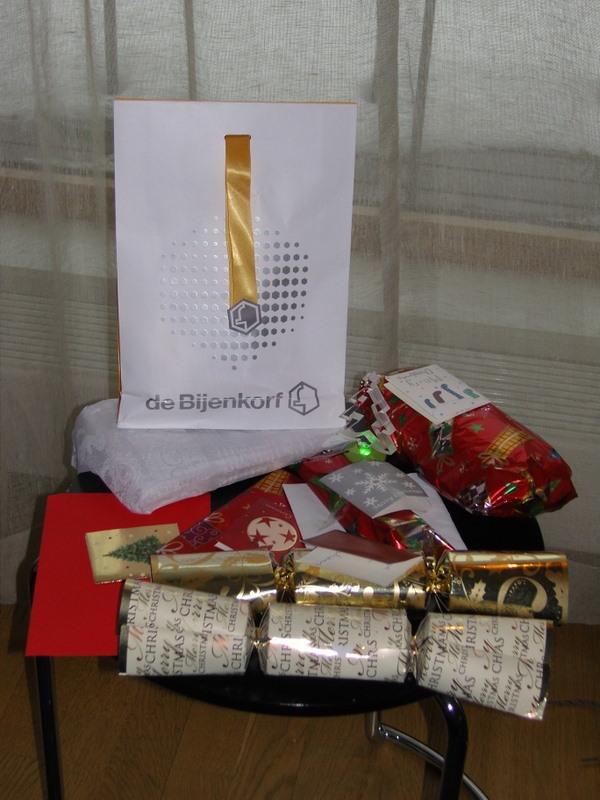 ), so our white Christmas was almost complete. A couple of Skype calls home to Greystones and Garforth reminded us of what we were missing. 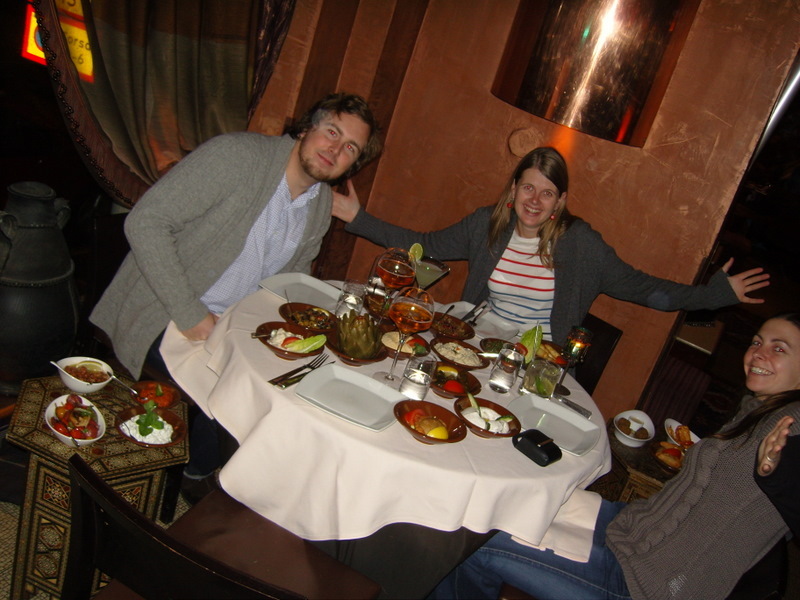 Our friends Ninni and Erik were home from Geneva for Christmas and very generously treated us to a feast at a Lebanese restaurant. It was good to see familiar faces on Christmas day. 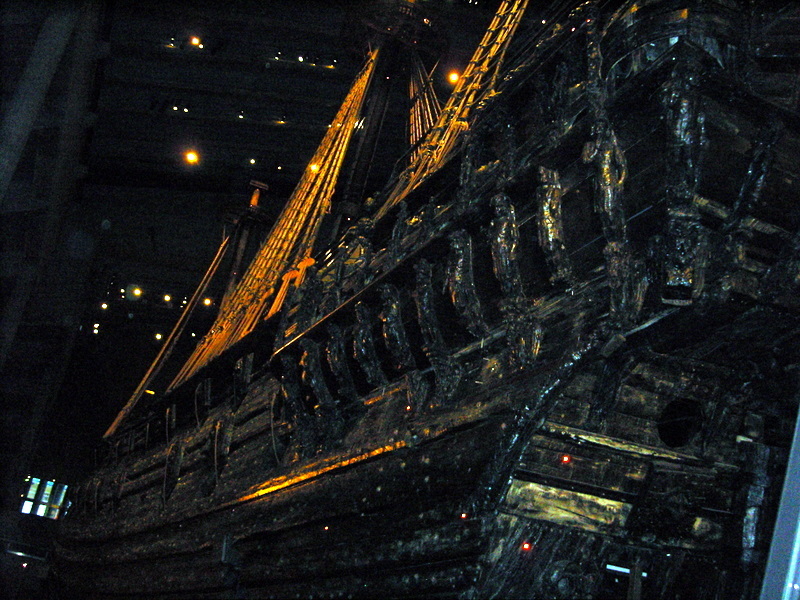 On the 26th the museums reopened so we visited the contemporary art gallery and the Vasa Museum. In the latter a 17th century war ship that was salvaged from the harbour is on display – it’s really well preserved as it sank about five minutes after leaving on its maiden voyage. 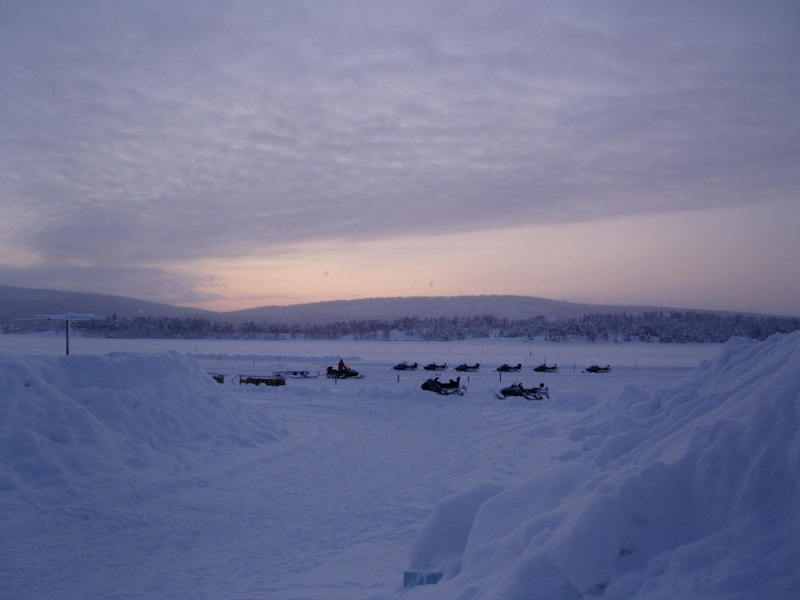 Kiruna is an important mining town that just happens to be quite close to the Ice Hotel in Jukkasjärvi and so gets a lot of tourists. 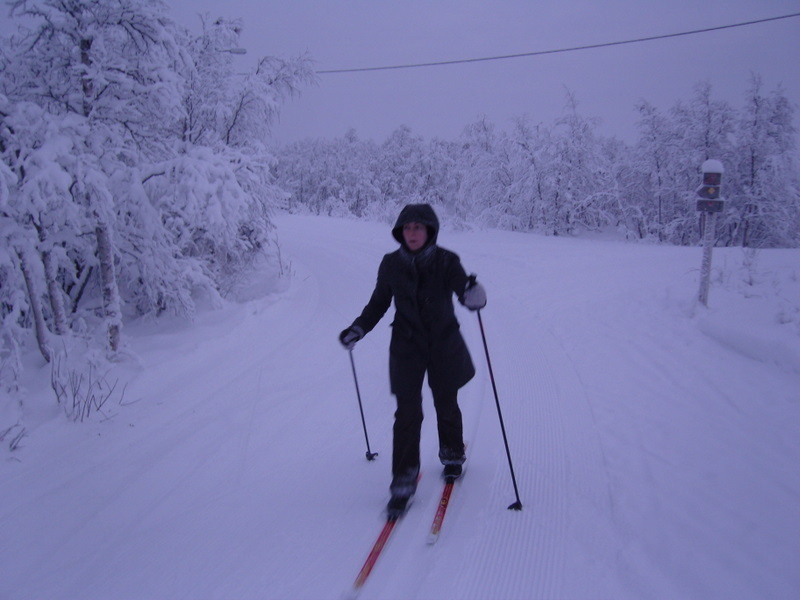 There was quite a lot to do there, including cross country skiing…. 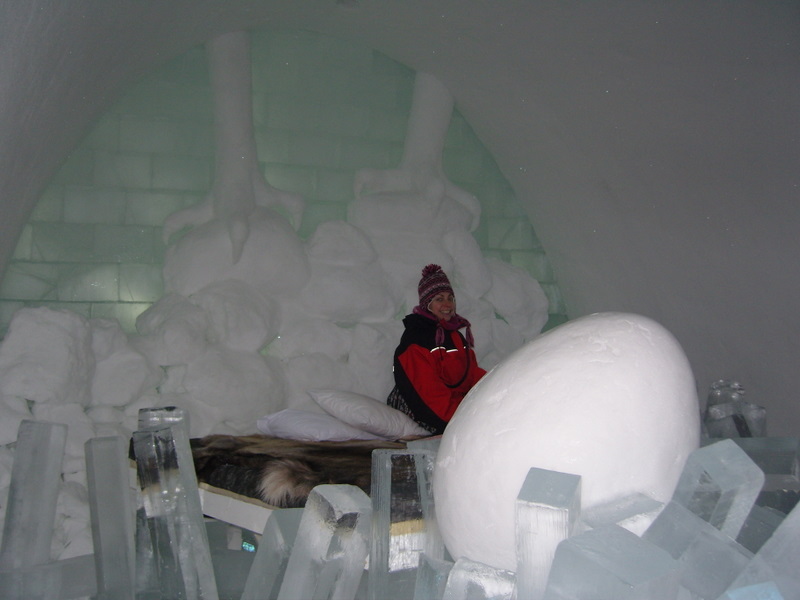 ….to the Ice Hotel. We didn’t stay there, but we took a tour around it. 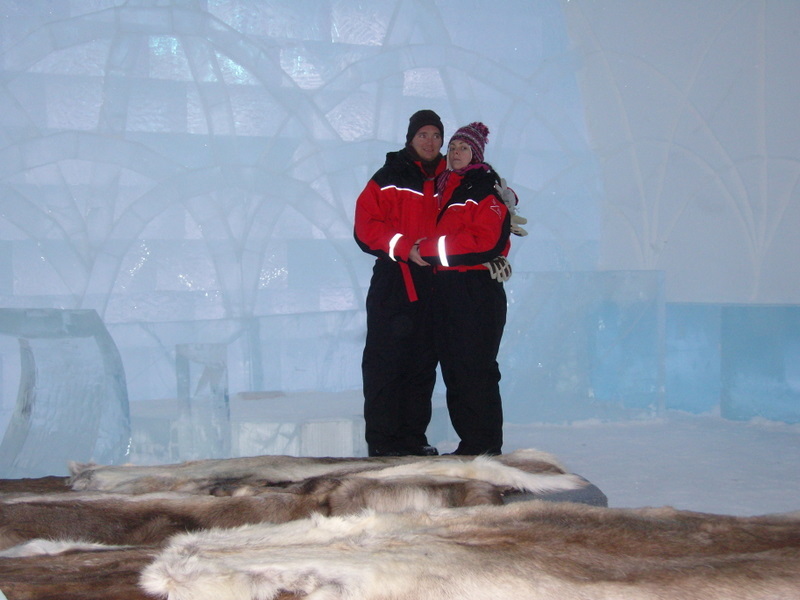 This photo was taken in the chapel – it’s not that easy to see, since everything’s made of ice, but we’re standing on the altar in this photo. And this is Nadine in one of the art suites. Each one is unique and they’re all newly designed each year – and most of them are really impressive. The glassy stuff is ice, and the white stuff is a mixture of snow and ice they call “snice”. 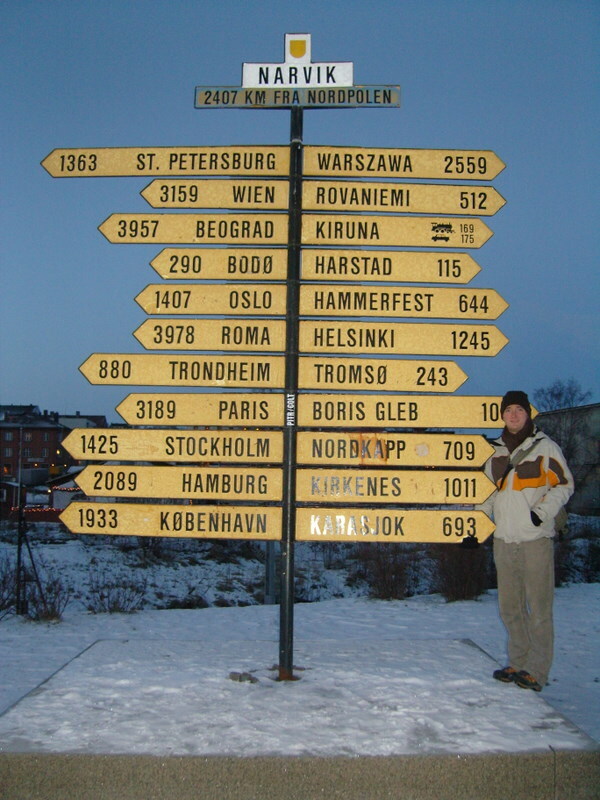 It was cold in Kiruna. 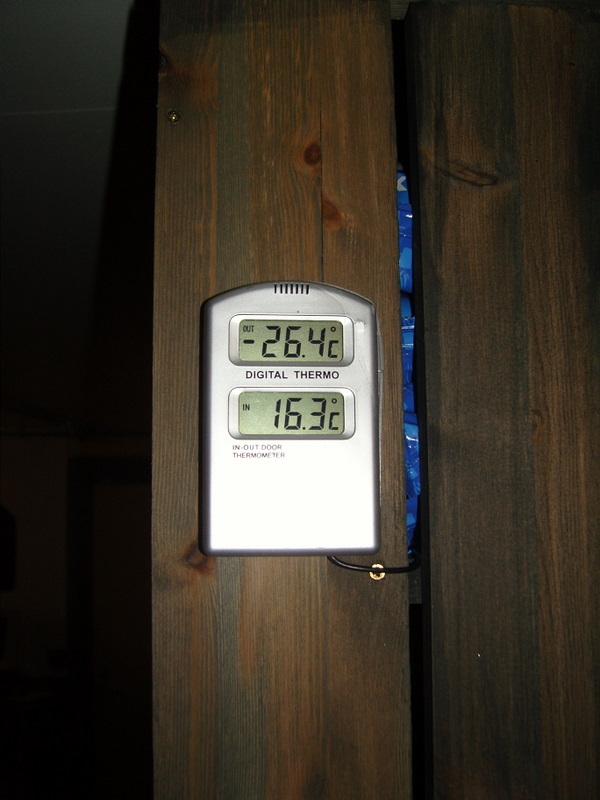 At least -20 degrees…and as you can see here, even inside it was quite chilly at 16 degrees. 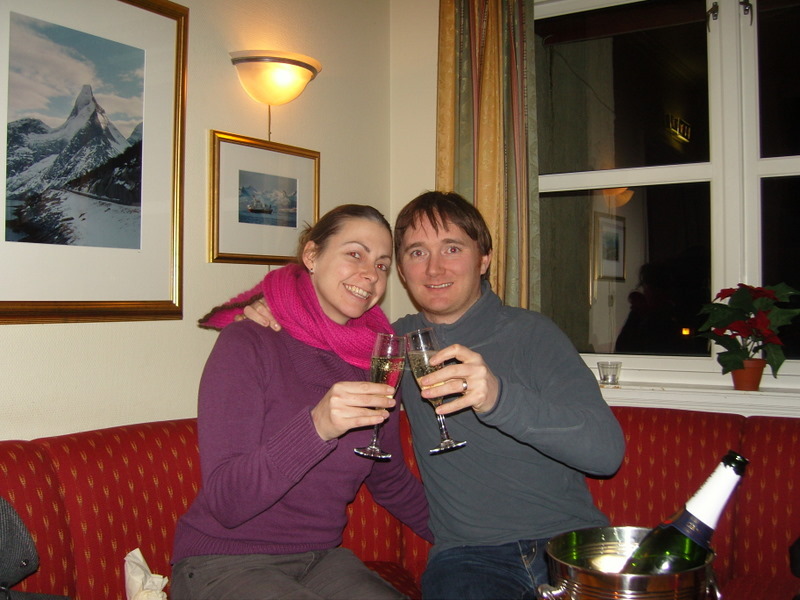 Anticipating the high price of alcohol in Norway, we had picked up a couple of bottles of bubbly in Sweden before crossing the border. 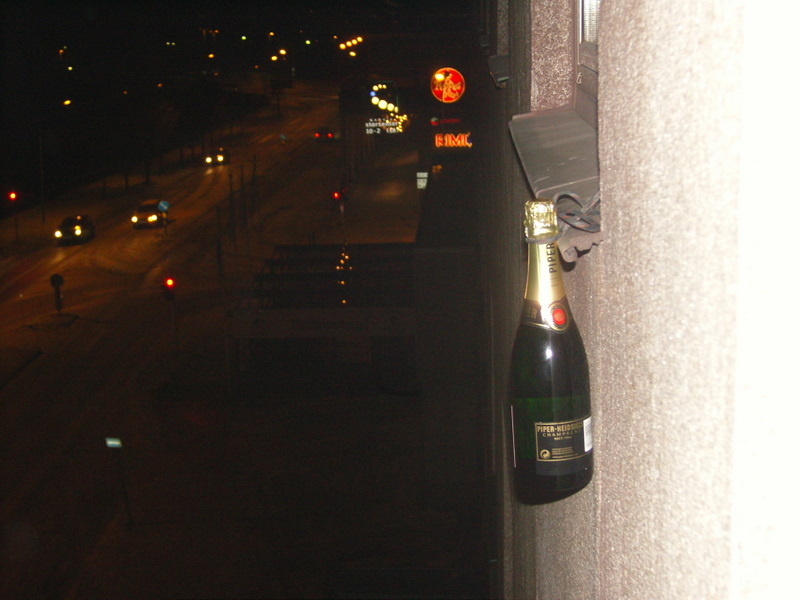 We chilled this bottle the natural way outside our hotel window with a little help from a bootlace. We did find the only open bar/club in Narvik on the 31st. There weren’t many people there – maybe the €16 cover charge put them off! 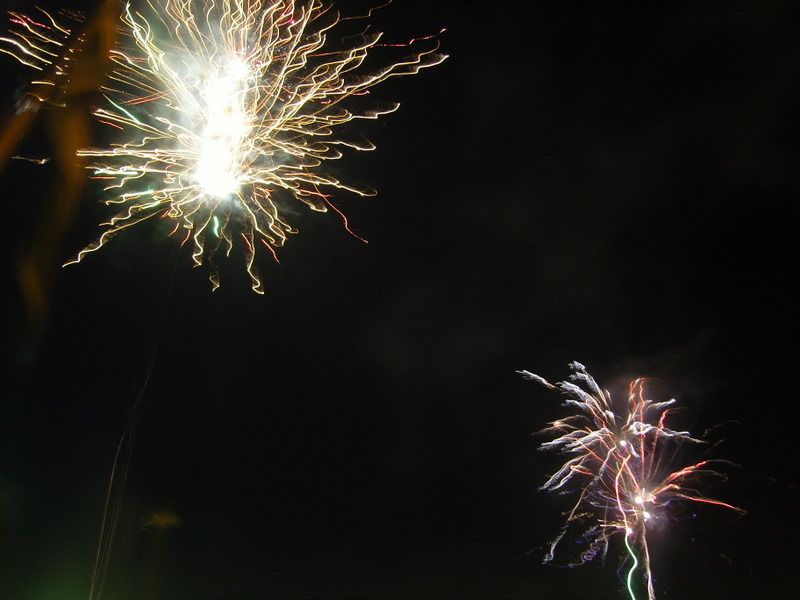 At midnight we discovered that a good portion of the population had stayed at home to let off fireworks – there was an amazing array of fireworks right across the town. 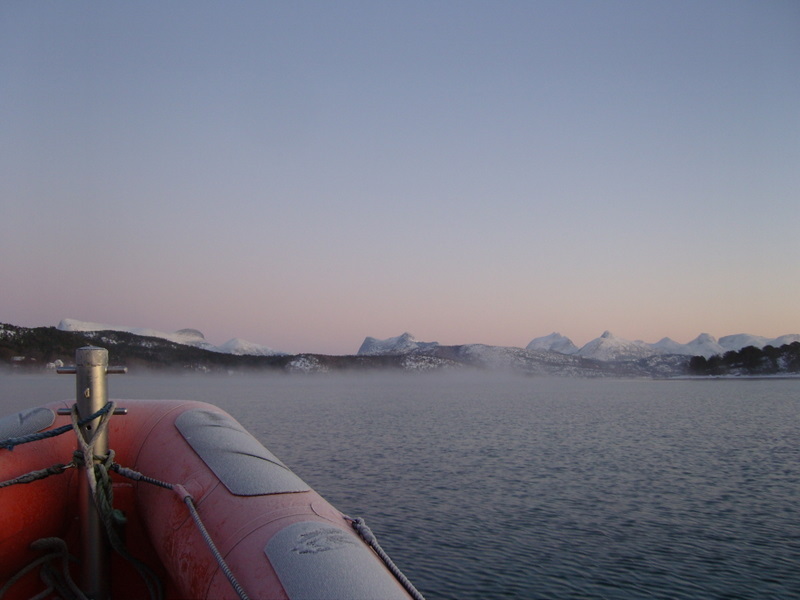 On January 1st a bus at 07:00 took us a couple of hours south to Tysfjord for an orca safari. We took the risk of paying extra to be able to snorkel with the whales, knowing that there was a chance we wouldn’t actually find them. (They had been around the previous day.) 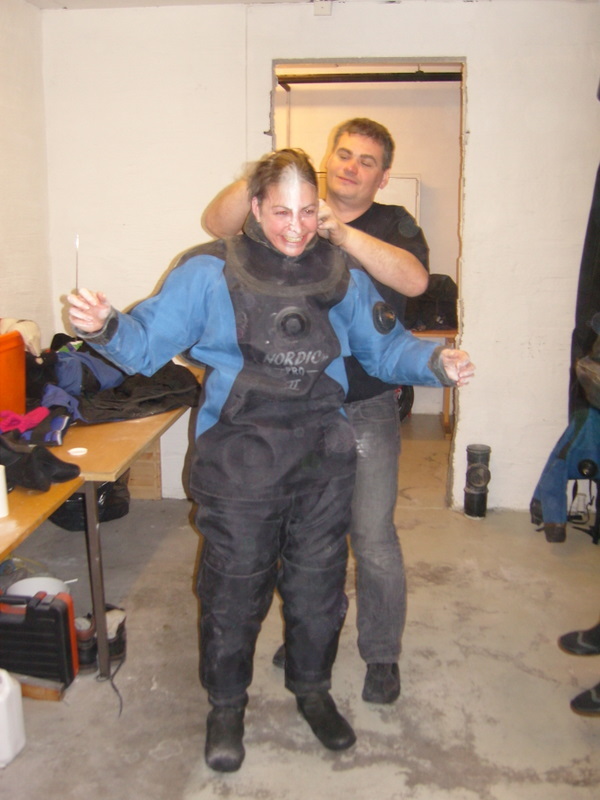 Nadine was manhandled into her dry-suit with a little help from some talcum powder. The scenery and the light were really beautiful. 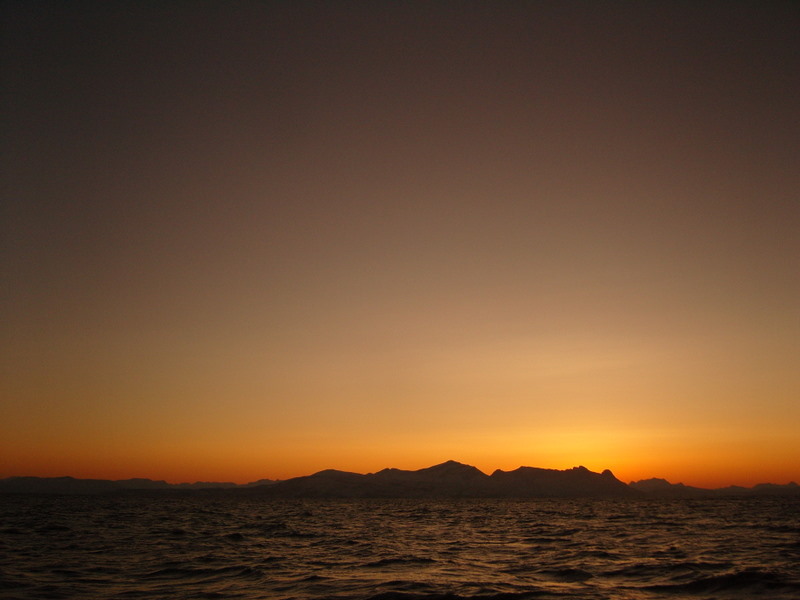 The orca unfortunately didn’t appear, so we had to make do with the stunning views. 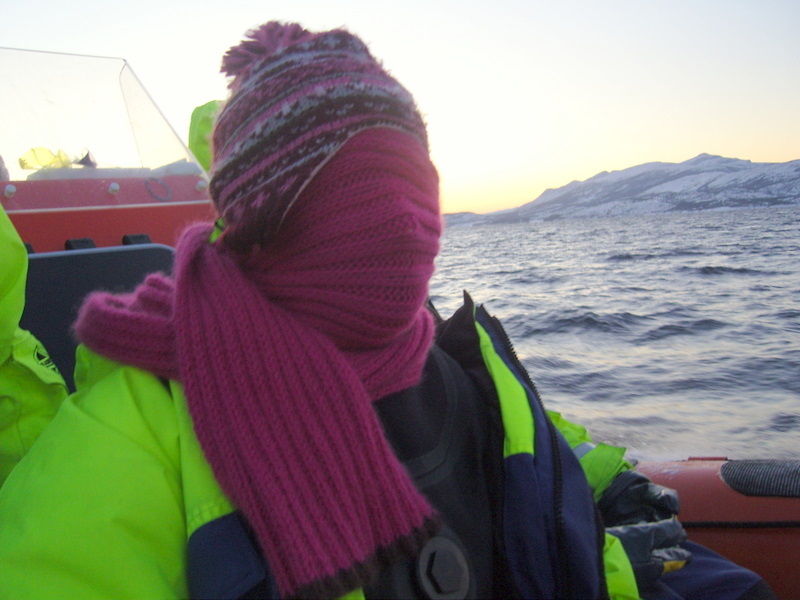 We had spent a lot of money on what turned out to be a rather expensive boat trip (albeit a very picturesque trip) and we had a six hour wait for the only bus back to Narvik with not much else to do at the orca centre. Oh well…time for another bottle of bubbly. 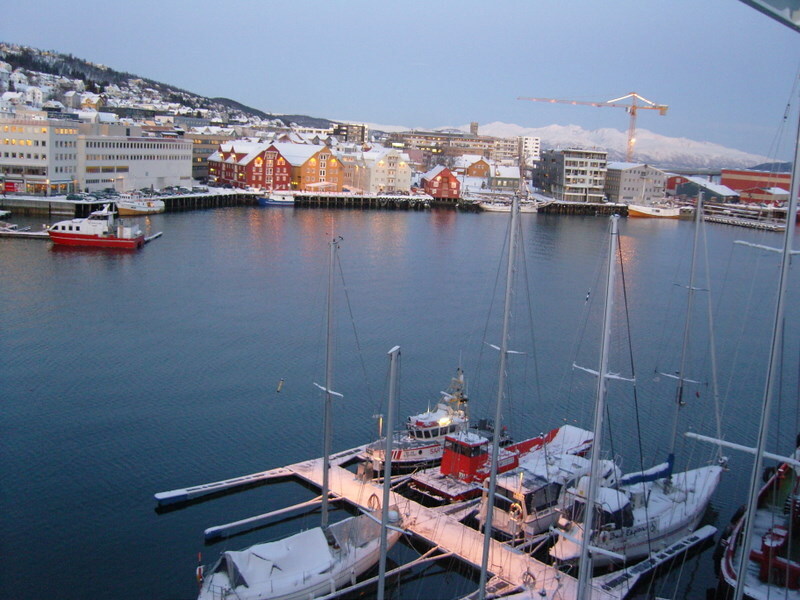 Our next, and final, destination was Tromsø, the world’s northernmost university town. 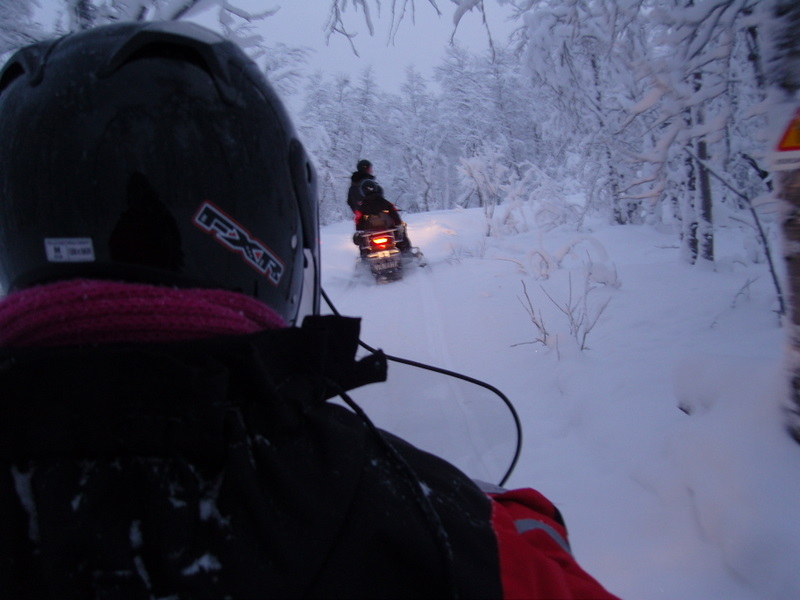 It was a welcome return to civilisation after Narvik. A pretty harbourside location, lots of (open!) bars and restaurants and plenty of things to do. This was the view from our hotel, the very lovely Rica Ishavshotel. 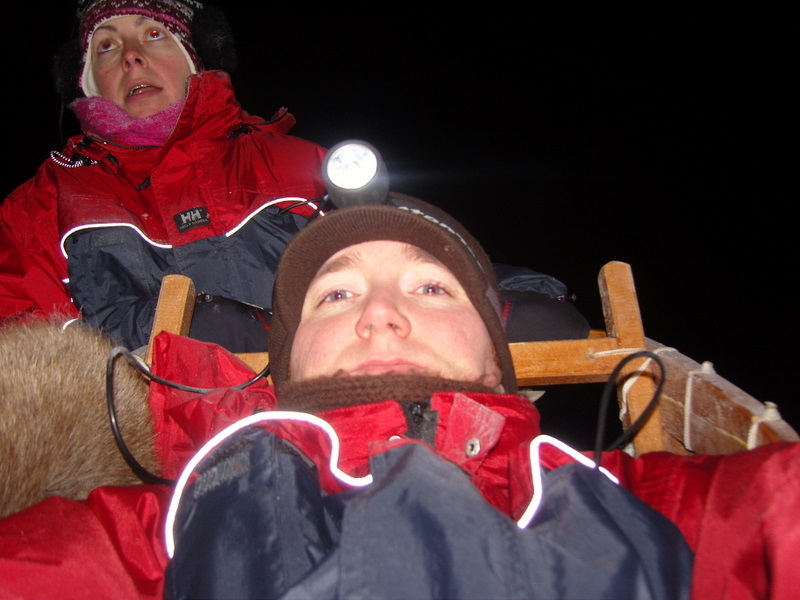 Eoghan’s sister Sheila and her fiancé Jérôme gave us a wedding gift of a dog sledding trip in the country side. It was a really fun experience! 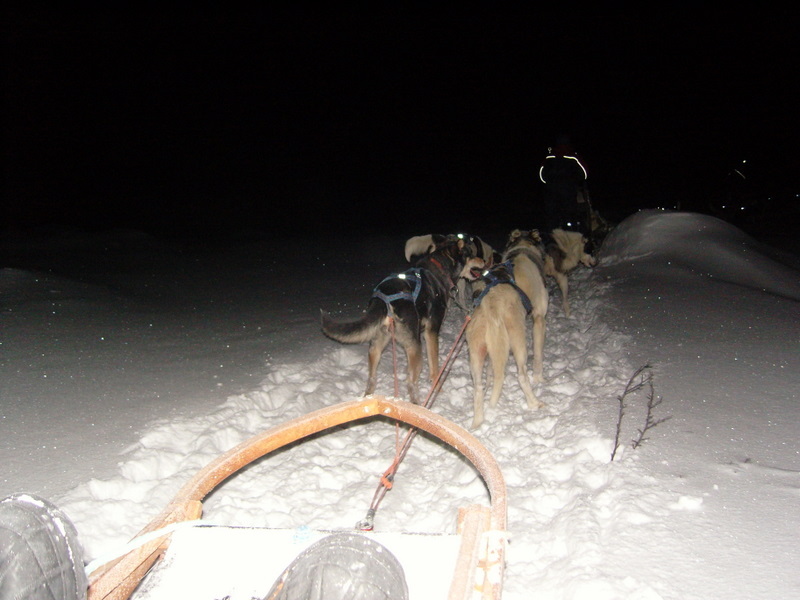 We shared a two-person sled with a team of six dogs for some of the time – here’s Nadine in action “at the wheel”. And we also got to drive our own one-person sleds with teams of four dogs. The dogs were Alaskan huskies. A visit to Tromsø wouldn’t be complete without a pint of Mack beer at the Ølhallen, the town’s oldest pub. Nadine stuck with the wine. 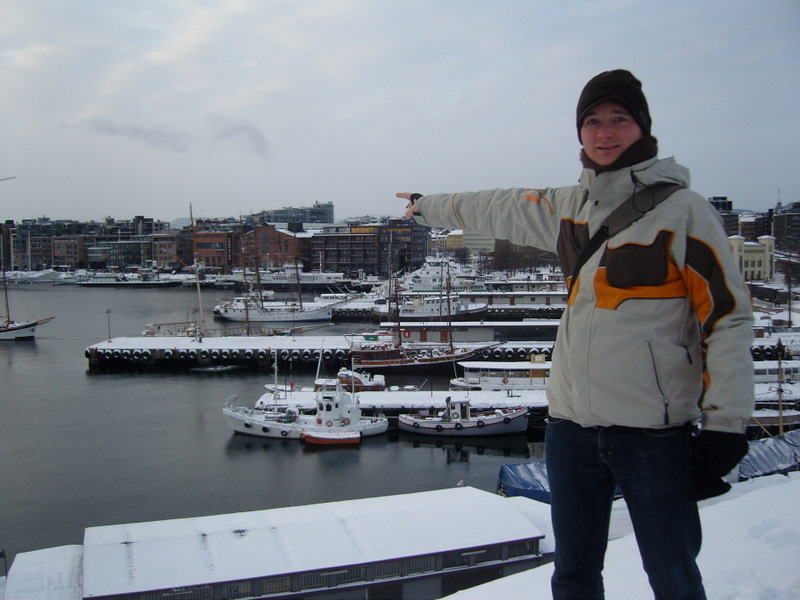 We flew back from Tromsø via Oslo where we had just enough time to zip into the city for lunch. 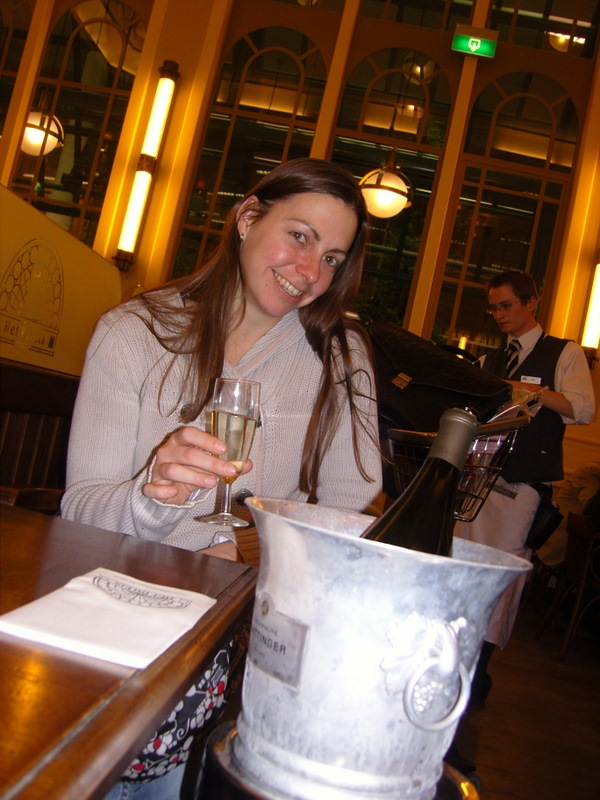 (Nadine needed some vegetarian sustenance having managed to eat both ham and fish in the previous two days!) 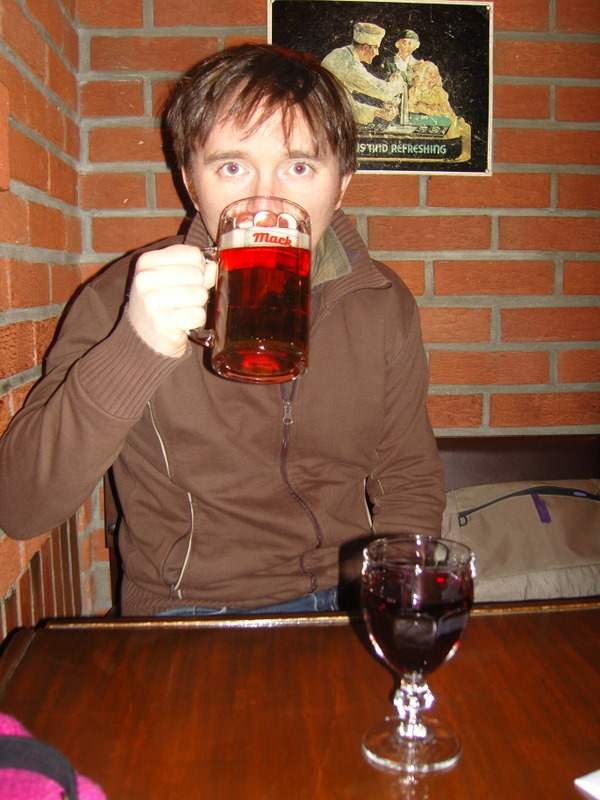 It was Eoghan’s first time back since his month singing at a bar there in summer 2002. The bar was somewhere over there. 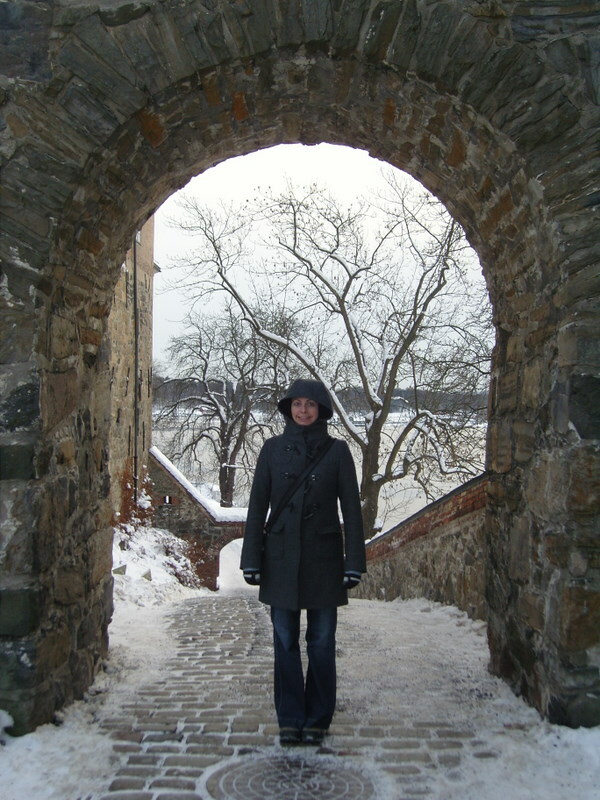 And here’s Nadine at Akershus Fortress on what was her first ever visit to Oslo…the visit was short and sweet, but it was a lovely way to end a memorable two week adventure in Scandinavia.